In the world of art, music and design, minimalism is defined as a style that uses pared-down design elements. The aesthetic began in post–World War II Western art, and most strongly with American visual arts in the 1960s and early 1970s. Today it is making a comeback in interiors and architecture. Defining early 21st century design, there is a return to the pared-down. More and more designers are realizing that less is more, and that real design comes in shape and structure, rather than a multitude of accessories. This home located in Berlin, Germany is a study in the minimalist aesthetic. Poland-based Loft Kolasiński worked on the interior design of this home with Eike Becker Architekten. Covering everything from the interior layout to product design, the interior includes a slew of custom products specifically designed for this minimalist space. Furniture and accessories have a focus on functionality and the purity of design. No ostentatious ornamentation can be found here, but instead clean lines with a mix of vintage and custom pieces. The green rug in the living area brings home a splash of color in this home's neutral color palette. The vintage carpet is a mid-century piece from the Czech Republic. This interior is filed with a multitude of unique details. Within the crisp white box, furnishings that have a story to tell have been brought him. Pieces like this lounge chair stand out. Curved lines are juxtaposition to the home's hard, concrete elements. The vintage nature of this side chair also helps bring an air of history to a space that is so modern. The red can seating also adds a bit of color to the neutral base of the living area. 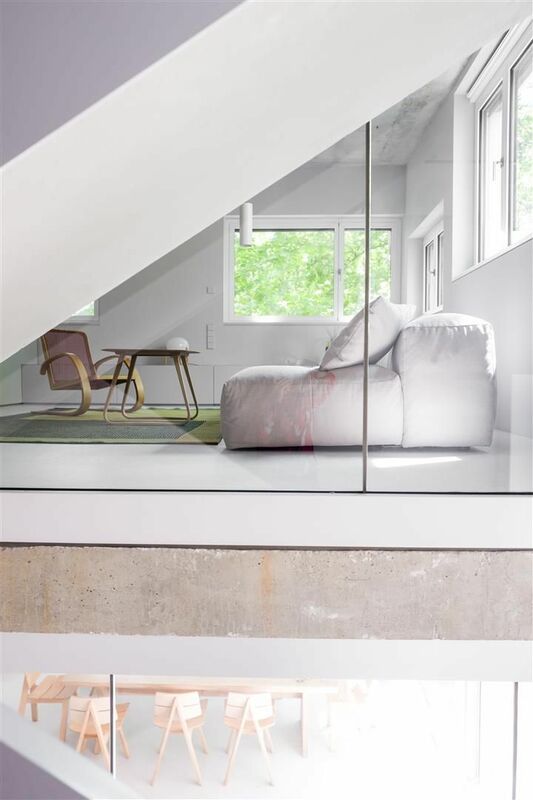 Loft Kolasiński does everything from designing interiors in public and private spaces, to industrial design. The design firm brought their multifaceted skills to the development of pieces specifically for this home. Tables, a bench, a chaise lounge and even hangers were all designed by the firm for the space. They even went as far as to design the bed in the home's master bedroom. A honey wood piece that is a complement to the home's clean lines and pared-down design. The piece has a Japanese feel to it with the mix of clean lines and carved wood elements. The honey tone of the wood, a powerful way to warm up the streamlined space. Much of this 1600 square foot interior is open plan. Rooms flow into each other seamlessly. The open plan creates a feeling of freedom and relaxation in the space. In the bedroom, it's open between the bed and bathroom, providing a hotel-like vibe. From the bed you can see into the bathing area where a glass shower surround and concrete soaking tub are present. The tub is also complimentary of the home's minimalist design. The edgy structure is a reflection of the hard lines of the interior. In minimalist spaces addressing the details is very important. The smallest touches are used to add elements of warmth and color into such spaces. The designers have addressed details in every part of the home. In the bathroom, concrete elements are softened by wood accessories. The wood elements are a reflection of honey wood bed in the bedroom. Here in the bathroom, a carved stool stands out as a warm element. Wood hooks have also been added. The functional pieces can hold everything from a robe to extra clothing, and are also a touch of warmth in an otherwise cool space. Down the concrete steps and you can see a glimpse of the art that has been brought home. Unique graphics of the Polish artist Stanisław Dawski dating back to the 1950s and the painting by the Brazilian painter Aecio Sarti are all on display in this interior. Beyond all of the glass, metal and concrete of the architecture, furnishings have been brought home the form a counterpoint to the stark architecture. Even in the smallest of nooks, furnishings stand out against the hard structure. Beyond the staircase, mid-century modern chairs displayed for comfortable seating. The chaise lounge was designed by Loft Kolasiński. It's streamlined design stands out in relation to the large yellow painting in the hallway. In the dining room, floor-to-ceiling curtains highlight the home's high ceilings. Pendant lighting also emphasizes the height of the space. A large dining table that easily seats eight is the ultimate statement piece in the dining room. The honey hue of the chairs and table pops in this otherwise gray dining area. The design firm's work did not end with the interior. They worked on the home's exterior as well. Here, unique elements were also designed to add interest to the space. A soft, curved lounge chair on the terrace truly stands out, like a piece of modern art in what is truly a modern, 21st century home.